Gena Raps: You are the icon of contemporary music written for piano. We’ve all played 20th – perhaps not yet 21st – century music, but your repertoire and legacy are unmatched. How did you land in the land of new music? Ursula Opens: There are many answers to that question. My parents were refugees from Europe. They came in 1938. My father joined the International Society for Contemporary Music in 1945. My parents thought they had left great culture behind, and it was exciting to me to find that great culture was in front of my very nose. Finally, there was the fact that my mother was a very strict piano teacher. She sent me to Leonard Shure, who was also a strict piano teacher. The only people who could trump – I hate to use that word – but who could supersede fancy piano teachers were the composers themselves, so I wanted to work with composers. GR: I first met you at registration when we entered Juilliard. I don’t know if you remember. UO: I don’t remember, but that supports the fact that we were there at the same time. GR: You had graduated from Radcliffe, and I was totally intimidated since I had been a bad girl in college, graduating late and with a young daughter. When did you decide to take the path of a solo pianist and go to Juilliard? UO: I don’t know. I know that the year before I entered Juilliard, it was still on 122nd Street. I walked through the corridors, walked in planning to apply, and walked right out again. GR: My first class in the masters program, the teacher went around the room asking, “Name third line note in the alto clef; fourth space note in the tenor clef,” and I didn’t know all the clefs. I had come from an academic college, Brooklyn College. I thought, I’ll never graduate. UO: What was Brooklyn College like when you were there? GR: Oh, don’t ask me that. I wanted an academic education, as you did, but I had a child so I had to live with my mother who helped with childcare. I loved the academics, and I also loved math, so I could do all of that. But the music department was so sexist that I don’t even want to think about it again. I accompanied the chorus and was replaced by a far inferior male pianist for the concert. At what point did you specialize in contemporary music? UO: I don’t specialize in contemporary music. I just think it’s part of my life, but it isn’t a specialty. GR: You’ve done so much! UO: I have been interested in it all my life. I’ve had the good fortune of commissioning some pieces that turned out to be super-duper wonderful. But I don’t believe in specializing. I believe that to be a fine musician, you should know as much about all music as you can. GR: How did you go about commissioning? UO: When no one has any money – if you’re talking about a junior third-year student at Mannes commissioning a third-year student at Mannes, one is a performer, one is a composer – you cook dinner for them. Later on when you’re a professional, you pay money; it can be your own money, it can be from a source like New Music USA or the Koussevitzky Foundation; you ask them for a grant. A hall can commission a piece. Carnegie Hall commissions. Wigmore Hall commissions. Since composers have to pay rent and they also have to eat, they get paid. GR: How much input do you have [in the compositional process], or does it vary? UO: Since I have no compositional imagination whatsoever, I try to have no input because I could only make a piece worse than it would be otherwise. I really mean that. For instance, with The People United Will Never Be Defeated, I was not expecting a 55-minute piece. There’s a rumor, a false rumor, saying that it was written as a companion piece for the Diabelli Variations. What happened was that I was talking with Frederic [Rzewski], and he was saying, “Well, what are you planning to learn?” I said, “Well, I’d like to play the Diabelli Variations one day.” I never played them because I got The People United. That’s a funny story. A commission could be for a birthday party, for moving into a new house. You might want three trumpet players to do a three-minute fanfare when you buy a house. It could be anything. I remember John Duffy, who was our inspiration, who founded Meet the Composer – he encouraged a town to do a commission for the opening of a new firehouse. If you look back in history, actually there’s an interesting precedent. I was reading Christoph Wolff’s book on Bach, and he said there were lots of Bach family people who were town musicians. That was one of the important jobs; they needed a musician to signify important events in a town. We don’t do that now, but that’s really what a commission should be. GR: What about you? You’re sitting around one day, having a nice cup of tea, and you think, Hmmm, I really wish so-and-so and so-and-so would write something for me. Is it as simple as that? The other is a former student of both Jerry’s [Lowenthal] and mine named Jonathan Katz, who proposed writing some four-hand music for us. In this case when Jonathan suggested it, we thought it a great idea. Those are the two unwritten pieces right now. GR: Did your education prepare you to play the kind of music you perform? UO: The most important thing is, you look at the notes on the page, and you don’t say, “Well, I’ve heard a recording of this, so I know how it goes.” You look at the notes. And this you do with Beethoven and with Nancarrow and with Charles Wuorinen. I can’t remember the exact quotation from Charles Wuorinen, saying why he was not so interested in electronic music at this time. He enjoys the fact that even a conventionally fixed score leaves room for the performer’s interpretation. You write a notation but it doesn’t fix a performance. That forte can be how many decibels? We don’t know. I think that learning to read words accurately and fairly in high school was part of learning to read music. GR: I always think that in the score, the composer’s talking to you. In a sense, the composer is writing a love letter to you. In this tumultuous time, let’s talk about music and politics. Thea Musgrave often writes about war and peace. For example, she wrote a choral piece in which a speaker quotes from the original BBC news of the bombings in London during the Second World War. Rzewski has written several pieces for you about poverty, such as Cotton Mill Blues, which I love. Was it collaboration? UO: Rzewski has always been interested in politics. Actually we went to the movie together, Norma Rae. which starred Sally Field. He wrote four pieces – the North American Ballads, a commission from Paul Jacobs. In that case, Paul had asked Frederic to write some pieces based on American popular music, and Frederic being Frederic, the first thing he wrote were some very abstract pieces which he called Squares. Paul said, “But this isn’t what I meant,” and then he wrote the North American Ballads, which I guess many people have played. It’s very exciting – they’re among the most played American compositions. GR: Did you inspire him for Cotton Mill Blues and for some of the other works? UO: I don’t know. Maybe. GR: I love looking through music I’ve never played. I’m always rummaging in the library to bring home a hidden treasure not often performed. The experience for me feels like a discovery and a puzzle as I work out the performance questions. It’s totally engaging. Even when I look at traditional composers whose language I understand, such as Mozart and Beethoven, I feel as if I’m on a hunt for the “golden mean.” The language in contemporary music is often akin to learning a foreign language, a new language. How do you experience these differences? UO: I’m going to take a little side trip to your question. Now that we don’t have real music stores anymore, it’s very hard to rummage through music that you aren’t sure about. On the Internet, there’s the question of copyright and you can’t just leaf through music. That’s just awful. UO: – at Mannes. Not every school has a good enough library. The first part of your question makes me very sad. I try to make no assumptions. What we were talking about, notation, a sixteenth note is a sixteenth note, a quarter note is a quarter note, an F is an F. I try not to assume that I know what it’s going to be. I start on the upper left-hand corner, and it’s very slow. It’s just maybe I have more patience than some other people. GR: You know what it reminds me of? Oliver Sacks spoke when my daughter graduated medical school – he spoke about his early experience as a student. He would go to the hospital to listen to people who were, shall we say, deranged – their sentences were not the syntax that we recognize. He would just sit there and listen for hours, and eventually he began to understand their symbolism. I thought that perhaps reading contemporary music is a similar experience. UO: I was just reading a description of Pauline Oliveros’ “deep listening,” and she was talking about the fact that probably babies don’t know how to organize the sounds they hear. We learn to organize them into words and sentences. She’s trying to get people to go back to the experience when these sounds weren’t put in groups, and that was a very exciting thought. It’s very interesting to think of sound that one has not yet organized. In fact, when we get to very late romantic music like Ravel, Fauré, and Franck, all their double-sharps and double-flats, it already becomes harder. We’re not so good at them. There is a greater difficulty when we are not in the same harmonic world. GR: We all have experienced some form of sexism. I read an interview where the interviewer kept asking you if you were trying to seduce your audience into appreciating the less accessible music you perform, and he asked the question several times. I’m sure he never asked a man that question. You terrifically answered the questions, referring only to the substance of the music. What other forms of sexism have you experienced? UO: The most important form is when you say something and no one hears you. I’ve noticed that often. I still notice it. It is very much that if I say something and 20 minutes later a man says the same thing, it is heard. I still think that is far more important than sexism, purely sexual harassment, because one can fight off sexual harassment. It is hard to fight off not being heard. GR: I’ll tell you a personal perspective: I told a friend who teaches at Juilliard that I was seeing you today. She said your name would be a household name if you were a man. That’s the way our colleagues feel about you. UO: That’s very sweet. But I really mean that. Not being heard is the worst because then, you try to be heard and someone says, “Oh, you’re shrill,” like guess who? GR: You speak of practicing five hours a day now. We all put in that kind of time and more when we were younger, but my hands couldn’t sustain that routine anymore. How are you doing? UO: When I have an emergency, my hands are fine. My back sometimes complains, but my hands are fine. I take lots of little, tiny breaks. This is something I think is very, very important for younger pianists, even if you take something like octaves in the Tchaikovsky concerto, you play them once and you get tense, right? That’s how many times you are supposed to play them in a performance. If you practice them over and over and over again, you can harm yourself. And yet, the way you’re playing them is perfectly correct. In other words, it isn’t that you’re playing them in a wrong way; it’s just that they’re supposed to come and go. I really think taking short breaks is essential for an instrumentalist. GR: We are lucky as musicians to be able to have a rich musical life at our age. This season I played the Mozart two-piano concerto with Ken Cooper, whom I’ve known since high school. Neither of us had played this concerto. It was fun untangling its mysteries with him. He’s a wonderful improviser, and I knew he would add new flourishes each time he played. You know Ken: you rehearse one way, and then you get up in public and it’s a different piece, which is an adventure. Now I’m working on The Art of the Fugue. What are you working on now? UO: I’m restudying Rachmaninoff’s Etudes Op. 33. If I weren’t here right now, that’s what I would be practicing. The reason I changed the time of our interview was that I’m having a dinner party with Charles Wuorinen this evening and that’s exciting. He’s someone whose music I adore, whose politics I just can’t think about. That’s another interesting question: What do you do with someone whose music you totally love, with whom I don’t even want to talk about politics? GR: I remember a NYT article about how difficult it is for young touring musicians to make a living. I believe you were one of the pianists mentioned in the article. UO: Basically you get performance fees or a teaching position or some combination. I didn’t start teaching full time until I was 50. I just wanted to see how good I could be as a performer. The first thing one has to realize when one starts teaching is that you must want your students to do as well as possible. I felt that my teacher Leonard Shure was competitive with his students. It’s like children. I haven’t had children of my own, so I don’t really know, but you just have to absolutely want them to do as well as possible. GR: I have taught a lot, and I absolutely agree with you. I also have the circumstance where my daughter’s father refused to support her dream of becoming a medical doctor. If she ever did anything better than he did, he would undermine her. I was the wind beneath her wings. I could see such different personalities and attitudes towards this child. UO: Even if you don’t know whether a musical phrase should go this way or that way, you should know that you want this person to feel good and to do well. GR: Which of your recent concerts moved you? UO: Next year, I’m playing the Mozart with a high school friend named Phillip Moll. We did it actually for our 50th college reunion with the Boston Pops. We’re going to do it in Bowling Green next year. I just played a concert in Basel, which was basically relatively new music. Sometimes I play music by dead composers who were friends of mine, and it’s really weird. GR: I believe in these later years you have found a love relationship. Oliver Sacks found love at 75. Can you talk about this? UO: I’ve had several love relationships. My current one is with a pianist, Jerome Lowenthal. We’ve been together for 20 years. He was happily married, and when his wife died, the whole musical world knew because she was such an important figure. I had been with a composer, a saxophonist, Hemphill. It’s fun to be with another musician. I had a boyfriend when I was quite young who was a terrific guy, but he said, “Music goes in one ear and out the other.” He’s still a terrific guy – you know? GR: Many thanks for being on the committee at Juilliard of the chamber music competition in my name. I just can’t believe this happened. UO: Is it still going on? GR: Yes. It’s given to a composer to write a string quartet and a trio. It’s been a thrill to hear the premier performances each spring in the Juilliard concert series at Tully Hall. When you look at a contemporary score, can you hear it? Is your ear training that finely tuned? UO: It’s not so bad. We actually had recordings. The scores I was not interested in were the ones where I thought the composer told the computer, “Oh, write whatever you feel like.” You look for an amount of similarity, an amount of difference; maybe there’s enough order so we can figure things out and enough disorder so we’re surprised. You have to let your intuition run the show because I don’t know what I’m doing. Just as with choosing a pianist. GR: I don’t believe it. You come with a world of experiences. UO: Not really. I feel – like with a composition or a pianist, we’re way beyond minimal competence, you know. If it intrigues you or challenges you; I find sometimes a student does something I never thought of before and convinces me. That’s exciting. GR: Thank you for sharing personal stories about your career and music making. You’ve been heroic in championing new music for the piano. There’s an African American baker near me in Harlem who has been in business forever and makes the best rugelach in town. Let’s have some rugelach from a brother. 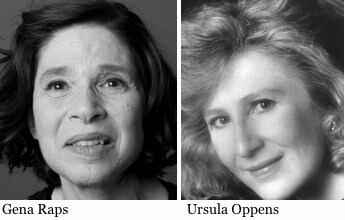 Ursula Oppens has long been recognized as the leading champion of contemporary American piano music. Her original and perceptive readings of other music, old and new, have earned her a place among the elect of today’s performing musicians. A prolific and critically acclaimed recording artist with five Grammy nominations, Oppens has recently released a new recording of Frederic Rzewski’s “The People United Will Never Be Defeated,” nominated for a Grammy in 2016; a collaboration with Meredith Monk, “Piano Songs”; the Grammy-nominated “Winging It: Piano Music of John Corigliano"; and Oppens Plays Carter, a recording of the complete piano works of Elliott Carter. As an orchestral guest soloist, Oppens has performed with virtually all of the world’s major orchestras, including the New York Philharmonic, the Boston Symphony Orchestra, the Los Angeles Philharmonic, the American Composers Orchestra, the Boston Modern Orchestra Project (BMOP), and the orchestras of Chicago, Cleveland, San Francisco, and Milwaukee. Abroad, she has appeared with such ensembles as the Berlin Symphony, Orchestre de la Suisse Romande, the Deutsche Symphonie, the Scottish BBC, and the London Philharmonic Orchestras. She is a Distinguished Professor of Music at Brooklyn College and the CUNY Graduate Center in New York City. She lives in New York City. Gena Raps studied with Artur Balsam, who considered her, Emanuel Ax, and Murray Perahia his three star students. Performing internationally and across the United States, Raps combines classical lyric playing with a rich keyboard sound. The New York Times wrote that her playing had “quiet majesty”; her performances have been described as “effortless and filled with passion.” Her many CD's have received rave reviews such as her CD for Naxos with Carol Wincenc "Mozart at 8": "playing with a degree of sophistication that exceeds by far our expectations." (Fanfare Magazine). Raps has collaborated in chamber music concerts internationally with artists such as Claude Monteux, Carol Wincenc, Charles Neidich, Artur Balsam, Kenneth Cooper among others. She has also dedicated her musical talents to educating children and to bringing awareness to social and human rights issues. She has taught at the Juilliard School and the Mannes College of Music, and has received numerous prizes and honors. She has been invited to give master classes abroad and at the Manhattan School of Music, and has been on the jury for competitions at the Juilliard School, Manhattan School of Music, and the Fulbright Fellowship. Raps is currently the music editor for Persimmon Tree. View More: Next piece "I Loved Him", Home, Archive. So good to see an interview with a woman musician. Can we have more? One suggestion, How about the woman who headed the Met Opera horn section for a long time? (Name escapes me right now) Heard that she also was encouraging to other women hornists. I just finished Murakami and Ozawa’s Absolutely on Music and this was an excellent complement. Wonderful interview, especially everything about commissioning and new music. I’m in a chorus that often commissions new music and our director heads Volti, which is truly astounding. Ozawa talked a lot in the book about reading a score it was interesting to see the idea arise here. Thanks. Wonderful, informative and inspirational……even for a non-musician!!! Thanks, Gena Raps & Ursula Oppens, for a fascinating, honest interchange of ideas!